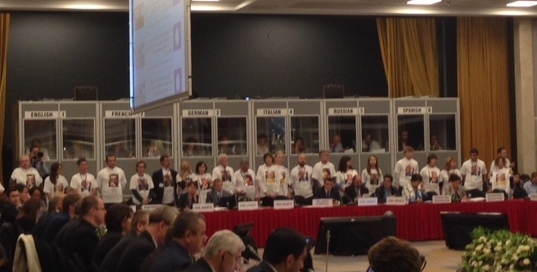 Photo: CSP members protesting silently in support of imprisoned colleagues at the OSCE HDIM in 2015. We, members of the Civic Solidarity Platform (CSP), are alarmed that the environment for civil society has seriously deteriorated in many OSCE participating States since the last HDIM and that civil society representatives who criticize repressive government policies and defend human rights and the rule of law face intimidation and harassment across the region. We are particularly concerned about individuals who have been arrested, criminally prosecuted and imprisoned following unfair trials because of their engagement in support of core OSCE values. We would like to use this opportunity to raise a number of cases of serious concern to us. However, the cases mentioned do not represent an exhaustive list; many other civil society representatives also face intimidation and harassment across the OSCE region for speaking out against injustice, human rights violations and arbitrary actions of authorities. Valentina Cherevatenko from Women of the Don became the first NGO leader in Russia to face criminal charges over non-compliance with the notorious “foreign agents” law. In July 2017, she was informed that the charges against her had been dropped. While this announcement was welcome, the threat of criminal prosecution of NGO leaders remains as long as the “foreign agents” law is in place. Currently close to 90 NGOs feature on the government-maintained list of “foreign agents” against their will, while some 70 other groups have been removed from the list after being forced to close down or stop receiving foreign funding. In early September 2017, the SOVA Centre for Information and Analysis and its director Alexander Verkhovsky learned that charges have been filed against them for violating the law on so-called undesirable organizations because of two links to donors listed as such organizations, which were posted on the centre’s website. [iv] A conviction could result in heavy fines. In another problematic development, a growing number of activists and common citizens have been charged under Russia’s broadly worded anti-extremist legislation after posting information challenging government policies on online platforms. [v] Several participants in peaceful anti-corruption protests held across Russia earlier this year were arrested on charges of allegedly using violence against police: some of them have already been sentenced to imprisonment, while other cases are pending. A series of human rights defenders, civil society activists, trade union leaders, journalists, social media users and other critical voices have recently faced criminal charges in Kazakhstan. The case of activists Max Bokayev and Talgat Ayan is illustrative of this crackdown: they were sentenced to five years in prison in November 2016 because of their involvement in peaceful land reform protests. [ix] The UN Working Group on Arbitrary Detention recently concluded that they were detained in retaliation for their exercise of freedom of expression and assembly and called for their release. [x] In another case that has been widely criticized, trade union leaders Nurbek Kushakbayev and Amin Yeleusinov were charged with criminal offenses and imprisoned after participating in a peaceful hunger strike to protest the closure of an independent trade union. Freelance journalist Saparmamed Nepeskuliev, who had reported on corruption and other issues, remains in prison in Turkmenistan after being given a three-year sentence on charges of narcotics possession in August 2015. Pro-democracy activist Gulgeldy Annaniyazov has been held in incommunicado detention since 2008 when he was sentenced to 11 years in prison after being arrested for allegedly crossing the border illegally. The UN Working Group on Arbitrary Detention has declared the detention of both men unlawful. [xi] As documented by civil society groups[xii], dozens of individuals imprisoned following politically motivated trials remain disappeared in the country. During the crackdown unleashed by the Turkish government following the failed July 2016 coup attempt, dozens of journalists, lawyers, human rights defenders and political activists have been detained. In a case has caused widespread dismay, eight representatives of civil society groups and two foreign digital and information security consultants were detained at a human rights training in July 2017 and subsequently charged with terrorist-related offenses. These include Özlem Dalkıran (Helsinki Citizens’ Assembly), lawyer Nalan Erkem (Helsinki Citizens’ Assembly), İlknur Üstün (Women’s Coalition), İdil Eser (Amnesty International Turkey director), Veli Acu (Human Rights Agenda Association), lawyer Günal Kurşun (Human Rights Agenda Association), Nejat Taştan (Equal Rights Watch Association) and Şeymus Özbekli (Rights Initiative), as well as Ali Gharawi and Peter Steudtner (foreign consultants). [xxiii] Nejat Taştan and Şeyhmus Özbekli were released pending trial in late July, but are subject to a travel ban. The others remain in custody. Ensure that no one is subjected to arbitrary arrest, criminalization, unwarranted legal proceedings or any other forms of misuse of judicial authority for acts related to their human rights engagement (OSCE Guidelines, article 23). In the event that criminal charges are brought against them, ensure that human rights defenders are granted a fair trial before a competent, independent and impartial tribunal, in full accordance with international standards (OSCE Guidelines, article 36). Ensure that human rights defenders who are deprived of their liberty are always treated in accordance with international standards, without discrimination of any kind and without being singled out for selective treatment to punish them (OSCE Guidelines, article 34). Refrain from engaging in smear campaigns, negative portrayals or the stigmatization of human rights defenders and their work and take proactive steps to counter discrediting of human rights defenders (OSCE Guidelines, article 37). Take action, through their diplomatic missions, to support human rights defenders at immediate risk of arbitrary detention, imprisonment and persecution in other states; and raise threats, arbitrary arrests and other serious human rights violations against human rights defenders through appropriate means with the states concerned, for example, in high-level meetings or at international forums (OSCE Guidelines, articles 98 and 99). Whenever required, facilitate the issuance of emergency visas and relocation support for individual human rights defenders to allow them to promptly leave the country where they are at risk and to ensure effective protection of their family members (OSCE Guidelines, article 100). The ODIHR should restore its focal point for human rights defenders and establish an expert panel on the protection of human rights defenders. The ODIHR should study the implementation of the Guidelines on the protection of human rights defenders by participating States in cooperation with civil society, using reports and information from such organizations. OSCE Chairmanships should prioritize the protection of civil society space and the security of human rights defenders, similarly to several successive chairmanships. OSCE actors should more systematically work with other inter-governmental organizations on the protection of civil society space and the security of human rights defenders. OSCE cooperation programmes should feature human rights conditionality. The benchmarks used should include implementation of UN Human Rights Committee views and European Court of Human Rights judgments issued in cases of persecution of civil society activists and human rights defenders. * Statement for Working sessions 1-2: Fundamental freedoms I, Monday 11 September 2017 and Tuesday 12 September 2017. (Kazakhstan), published on 27 June 2017. [xi] Opinions No. 40/2015 and No. 22/2013 of the Working Group on Arbitrary Detention. [xiii] Report of the Special Rapporteur on the promotion and protection of the right to freedom of opinion and expression on his mission to Tajikistan, published in June 2017. [xviii] See List of Political Prisoners, http://spring96.org/en/news/49539. [xxii] This statement is available at: http://www.kgb-pmr.com/news/370 In October 2016, Promo Lex was informed that its members will not be granted access to the proceedings in the supposed criminal case against the organization.